The Bauhaus parties are legendary: In the 1920s the Bauhauslers celebrated with elaborate mise-en-scène, costumes and concerts – and the entire city celebrated with them. The Bauhaus Dessau Foundation has revived this tradition every year since 2007 with experimental projects, installations, performances, readings, with music, dance and food. Held under a different motto every year, the Bauhaus building and the surrounding urban area are artistically staged and used for performances by regional, national and international artists, designers, musicians and students. 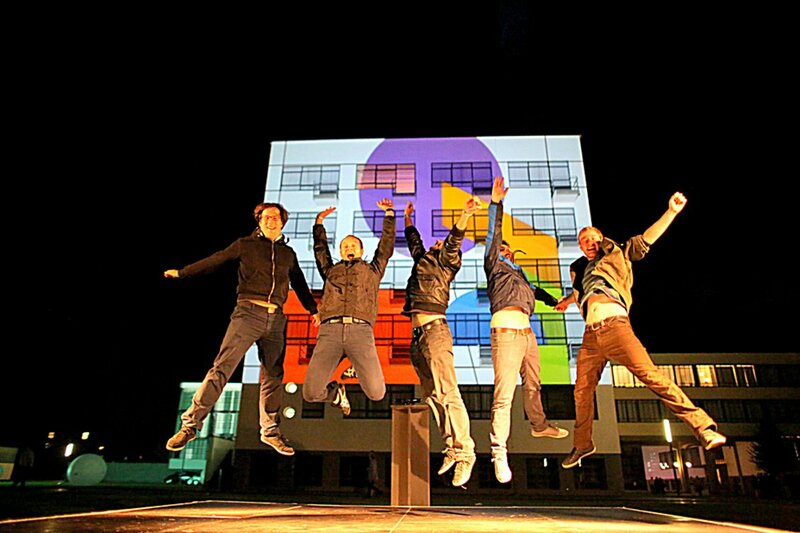 The Bauhaus Festival is an arts festival which attracts around 5,000 visitors annually. The Bauhaus Festival 2016 starts with the theatrical utopias of László Moholy-Nagy and transports its visitors to the world of circus and cabaret – two art forms that were already extremely popular in the 1920s, also at the Bauhaus. In the tradition of the Bauhaus party, students of art, music, film, design and architecture will bring the festival to life with their project ideas, performances and light installations. Later on, it is the visitors themselves who will enliven the many music stages with their dancing. In 2015 the Bauhaus Festival referred back to the Bauhaus master Wassily Kandinsky and his work in the artists’ collective Die Blaue Vier, founded in 1924, which besides Kandinsky included among its members the Bauhaus masters Paul Klee and Lyonel Feininger and Alexej von Jawlensky. The origin of today's Bauhausfest lies in the historical Bauhaus of the 20ies where elaborate festivities served as a vehicle for the exchange between masters, students and Dessau's citizens. The Bauhaus celebrated birthdays, farewells, christmas and other occasions with speeches, concerts and performances in spectacular costumes. The Bauhaus festivals were used for self-expression and simultaneously gave the city of Dessau a cause for celebrating itself. The annual Bauhausfest is building upon this tradition since 1997. Experimental projects, complex room setups, performances, music and dancing provide a very special event throughout the city – from the Anhaltisches Theater to the main station and further to the Bauhaus building itself.